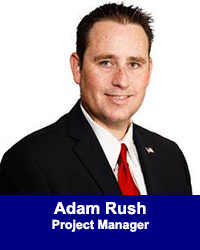 Adam Rush New Grant Writer - California Consulting, INC.
Adam Rush received his Bachelors of Arts from Claremont McKenna College in Government and Political Philosophy and a Masters Degree in American Politics from Claremont Graduate University. Mr. Rush is a member of the American Institute of Certified Planners (AICP), the American Planning Association (APA), and Association of Environmental Professionals (AEP). Mr. Rush’s land use and environmental career began at the County of Riverside Planning Department in 2003, where he served ten years and left to join private practice in 2013. In addition, Mr. Rush participated in the grassroots incorporation effort for the Eastvale Incorporation and was honored to serve as the first Mayor for the City of Eastvale in 2010. Mr. Rush now serves as a member of the Eastvale City Council. Mr. Rush lives in the community of Eastvale with his wife and three children.